Siwandu (formerly known as Selous Safari Camp) is on the banks of Lake Nzerakera in Selous Game Reserve. The main camp has 13 tents and several communal areas, and is divided in north (7 tents) and south (6 tents) camps. A little distance away there's an exclusive private camp. The camps are unfenced so animals are free to wander through and you can view wildlife without having to leave your tent! The tents are large and luxurious, set on raised wooden platforms with thatched roofs. They have double beds, ceiling fans, bedside tables, lamps, a writing desk and sofa. The en-suite bathrooms are spacious and have twin hand basins and flush toilets. There is a separate shower area open to the skies. Between activities you can sit on your private veranda and enjoy the views. The main camp has a large thatched lounge, bar and dining area, where you will enjoy delicious, freshly-cooked meals. There is a swimming pool for that cooling dip and a sundeck. Towels and sun loungers are provided. Siwandu offers a variety of ways to view the diverse wildlife and habitats of Selous Game Reserve. 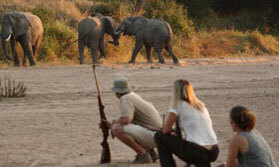 Traditional game drives in open vehicles operate in the mornings and early evenings. Boat trips on the river offer a different perspective and a chance to view hippos and crocodiles and numerous water birds. Guided game walks are a great way to get close to nature, to observe the small species often overlooked from vehicles, learn about medicinal uses of plants and find out about tracking skills. Open: Siwandu is open from June till mid-March. Location: Siwandu is on the banks of Lake Nzerakera in Selous Game Reserve. There is an airstrip just 10 minutesâ€™ drive from the camp. Rooms: There are 13 luxury tents in the main camp, and additional tents in the private camp. The main camp is spilt into smaller units, north camp with 7 tents and south camp with 6 tents. All tents in the main camp are on wooden platforms and have a large double bed, bedside tables and lamps, a sofa and writing desk. There is 24-hour power and power points where you can charge batteries. The en-suite bathrooms have twin brass basins and there is a separate outdoor shower area. There are verandas to the front and rear of the tents with chairs. Activities: Siwandu offers morning and afternoon game drives in open 4x4 vehicles, motor boat rides on the river and game walks with a professional guide and a national park ranger. This is a good area for bird watching, with over 300 species. Fishing is offered subject to conditions and needs to be paid for locally. Fly camping can be arranged subject to weather conditions and needs to be booked in advance. Facilities: The camp has a lounge with large sofas and a wildlife reference library, a bar and a dining area, all overlooking the lake. There is a swimming pool and sundeck with day beds and towels. Dining: Meals are taken at individual tables indoors in the main thatched lapa and outdoors by the campfire. Children: Children over the age of 6 are welcome, although there are no special facilities for children. A maximum of 3 children are allowed in camp at any one time. The camp is unfenced and animals do wander through, so children must be kept under surveillance at all times. "This is a safari with comfort and style, set in beautiful surroundings. In your room, every little thing have been thought of and the food was fantastic. You can choose how your day is spent, from game drives, boating on the lake, bush walking or even relaxing by the pool. " "Accommodation was excellent with nice outside shower. The surprise boat lunch was a charming thought." "Really good place - good wildlife and superb management "
"A completely different experience to the Serengeti. The Lodge was mainly canvas with a wonderful view of the lake. Elephants and giraffes wondered by as did monkeys etc. The birds were beautiful too. The tents were beautiful. A step back in time with lovely dark wood furniture and a very inviting outside shower. Tea and coffee delivered as a wake up call was the perfect start to the day as were the drinks we were met with every time we returned from a Game drive. Delicious local food served in a wonderful setting high on a balcony overlooking the lake or down by the camp fire in candle light. Or lunch on the boat in the lake surrounded by hippos and crocodiles. A walking safari ending up with the most amazing breakfast or drinks watching the sun set made this a wonderful place - we were sad to leave."